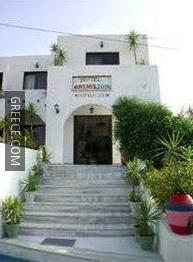 Situated in Archangelos, the Anthula Sun is within easy driving distance of Faliraki and Lindos. This hotel is ideally located in the town centre. The hotel has 17 rooms and has been recently refurbished. The hotel also provides luggage storage, bicycle rental and a 24 hour reception. A safe, a terrace and a car rental desk are also available to guests. Diagoras International Airport is under a 35-minute drive from the hotel.